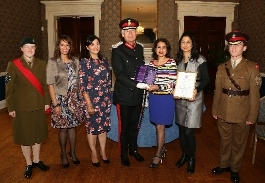 The Queen’s Award for Voluntary Service is the highest award given to volunteer groups across the UK for outstanding work in their local communities for the benefit of others. 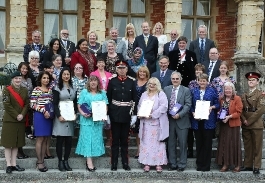 The Lieutenancy is heavily involved in promoting and organising these Awards in the County. In recent years, many voluntary groups in Berkshire have received this prestigious award. The annual Award – the equivalent of an MBE – was created by Her Majesty in 2002 to celebrate her Golden Jubilee. The Awards are announced on 2nd June each year the anniversary of The Queen’s coronation. Winning groups receive a certificate signed by the Queen and a commemorative crystal pillar. In recent years members of the Royal Family have often presented the awards in Berkshire at a special ceremony arranged by the Lieutenancy. This major UK national honour sets the national benchmark for excellence in volunteering. Each nomination is judged on the benefits it gives to the local community. There is not a set number of winners in a sector of volunteering work or region of the country. You are actively encouraged to nominate any volunteer group in Berkshire if you know about the work they do and believe it should be honoured in this way. In common with the UK National Honours, there are no deadlines for the receipt of nomination forms. Award nominations will be considered at any point within 3 years of the nomination. Any group of two or more people doing volunteering work (for three years or more) that is a social, economic or environmental service to the local community can be nominated for the award.